We’ve been highlighting a few of the great home haunts in the Santa Clarita Valley over the past week, but if I’m to be honest, when I was first organizing this season’s haunt visits, I initially only knew of a single and very famous home haunt: Beware the Dark Realm. It wasn’t until I was shuffling schedules around and realized that I might actually have an opening for Santa Clarita after all that I started to find other SCV haunts like Shiver, Club Fear, and Coffinwood Cemetery. But with no disrespect or offense intended to the preceding three very fine haunted attractions, Beware the Dark Realm was the most anticipated. So we made it our final stop for our haunt adventure group on our wild, five-haunt night a couple Fridays ago—an evening that began in Glendale with Opechee Haunt! The king welcomes you to the Dark Realm. Just look out for the dragon. Beware the Dark Realm is the monumental production of Scott Sivley and his family. It has been operating under this monicker for seven years, and the Sivley clan has been doing a haunt in this location for three decades. There have different themes from the current medieval aesthetic, from clowns to aliens, vampires to zombies, an Egyptian theme and more. In addition, the Silvley haunting experience in their prior residence in the San Fernando Valley stretches back even further, all the way to 1971! That’s older than Knott’s Scary Farm! All of that history makes its presence shown in various facets of a sprawling, winding maze that never seems to end… one that is teeming with fiends and ghouls and creatures in search of prey. A witch brews up a sinisterly wicked potable. One’s immediate impression upon arriving at Beware the Dark Realm is pure awe at its two story castle facade. Yes, two stories! The residence itself is actually one—wherever it is, hidden behind those bulky stone walls even step back on the second floor. It’s a complete transformation of something from quiet surburbia to the battle-ravaged, disease-ridden, less civilized Middle Ages. Lines to enter often stretch down the street, but guests have the entertainment of a few roving street monsters to pass the time. Once they step inside, though, modern day America ceases to exist. They are in the Dark Realm. There are demons and other nefarious creatures lurking in the dark. The Dark Realm monicker is no false advertisement. This is a very dim maze, which makes photography relatively difficult but really enhances the ambiance when experienced in person. Incoming victims—er, visitors—are immediately greeted by the king of this domain, who gives them a choice of two paths to take. That’s a trick, however, as they both converge at a pop-out scare by the very same monarch who laughs villainously at their startle and fright, then bids them fair warning of a dragon beyond the village. The village presents more opportunities for scares, plus some delightful interactions, including one with a resident witch who is conjuring some horrid concoction made of mystical ingredients—and children. Definitely children. Organic, GMO-free children. 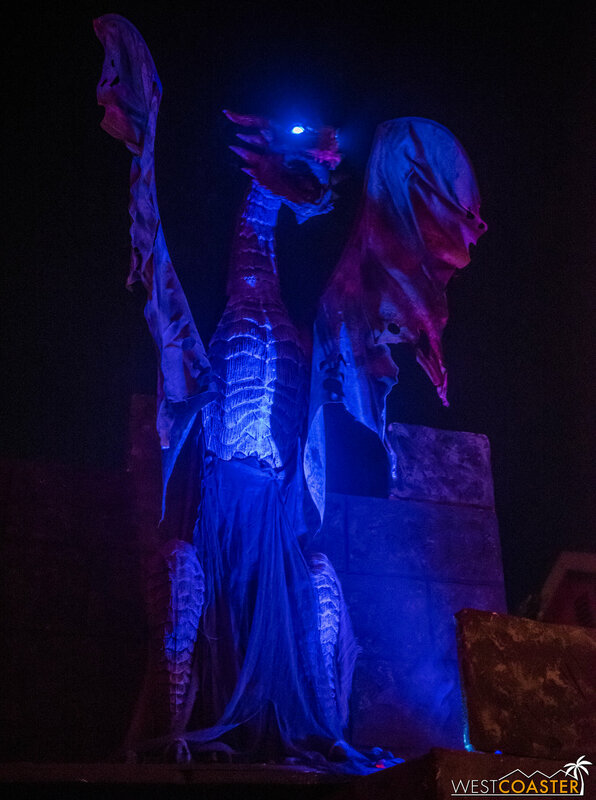 Progressing forward, guests approach the castle in proper, and lo and behold, there is the dragon everyone was warned about! Perched on the roof high above, this impressive animatronic moves and roars, glaring down on the puny humans below. 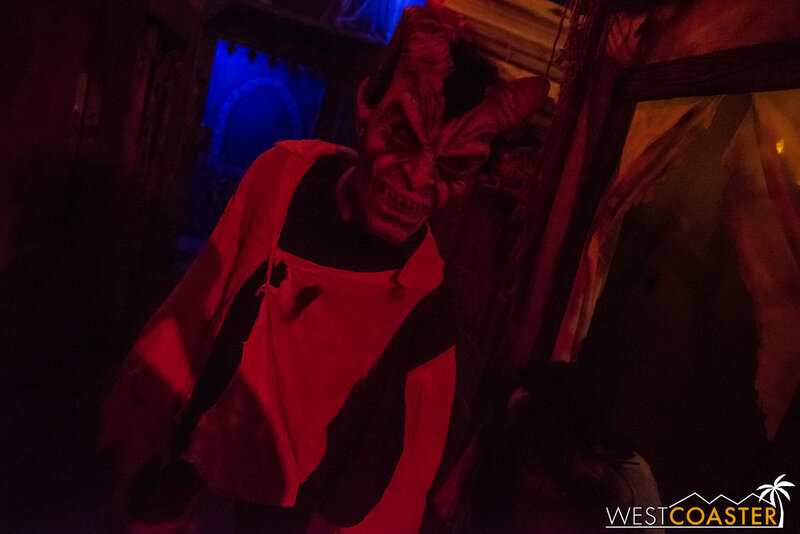 Things really start to pick up once guests move into the interior space of the maze, winding through a series of crypts and passages deep within the castle depths, encountering a variety of ghouls and demons and creatures possessed. With even more shadows and dark crannies, the talent can really ambush unsuspecting guests with greater intensity than earlier, sometimes even in tandem for some great double team scares. Others serve as misdirection or distractions. And there are even some creep scares too—constant attention that becomes uncomfortable to absorb. The Dark Realm gets darker as guests head indoors. Dim candlelight is often the only illumination in many of the maze spaces. All of this adds up to an extensive and thrilling home haunt experience. Having never been able to make it out here before, we were thoroughly impressed by the theming, scareactor interactions, and overall environment of Beware the Dark Realm. There’s a reason this is one of the haunts featured in the new documentary, Epic Home Haunts. It’s very much epic, and mixes in a fantastic blend of traditional, old-fashioned scares and grittiness with a bit of new age technology and a level of immersion that has become much more expected of new haunts than those that began ten, twenty, thirty years ago. The cast of this haunt also deserves major merit. Their boundless energy and commitment to their roles seamlessly weaves an addictive walkthrough experience, they never seem to miss a beat. Even at the end of the night, they were still fully in character and intensely in their roles. And that doesn’t even get into the fact that Beware the Dark Realm employed the use of a lot of cast members—a dozen and a half or so—well more than pretty much any other haunt we’ve visited. Talent is often the most difficult constant to maintain at home haunts, and it’s a testament to the respect and quality of Beware the Dark Realm that they are able to attract such a large group! Escape the dungeon, if you can! Unsurprisingly, we ended up having a blast at our visit. 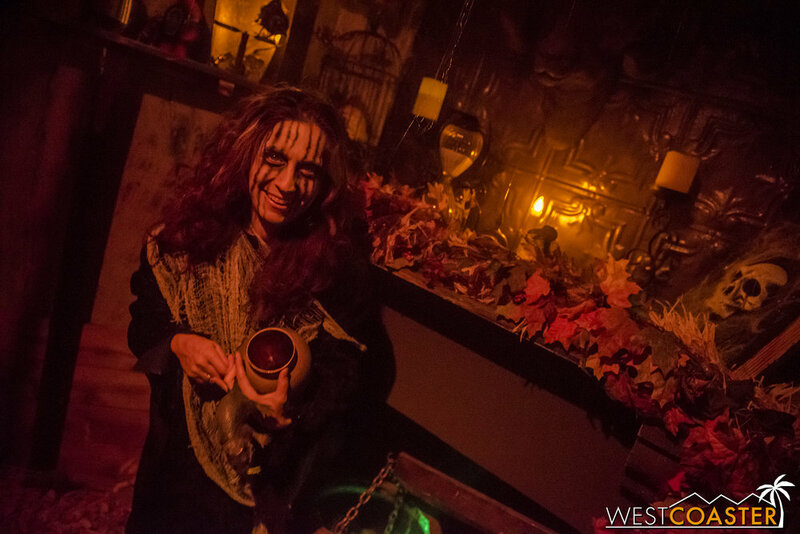 The quality and experience at Beware the Dark Realm can give many professional haunts a run for their money! Speaking of… as with all home haunts, admission is completely free, though donations are encouraged. For the past few years, Beware the Dark Realm has partnered with Child & Family Center and sent its donations to the organization to assist domestic violence victims. The charitable aspect of the maze is yet another plus in a long line of them. 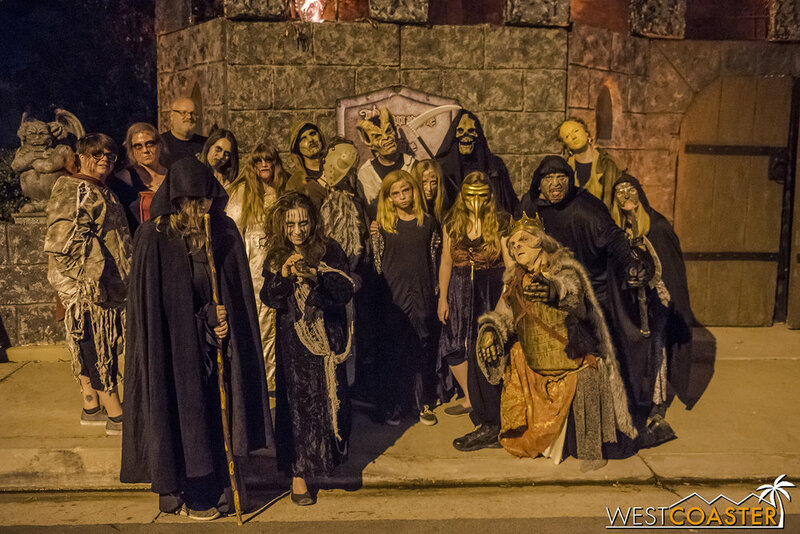 We love seeing haunts turn their passion and popularity into endeavors that help the greater community. “Scare because we care.” It’s a bit corny, but it’s generous, thoughtful, and gracious. A group photo of the Beware the Dark Realm cast. Beware the Dark Realm is located at 28621 Sugar Pine Way, Santa Clarita, CA 91390 and was open the last two Fridays and last three Saturdays of this past October. It was closed on Halloween night. Keep that in mind for game-planning a Santa Clarita haunts trip next year! 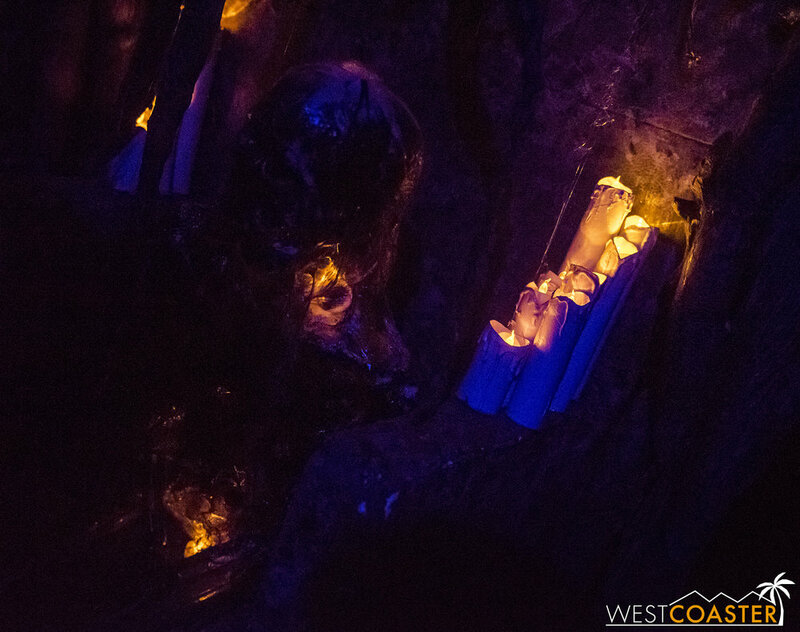 Beware the Dark Realm is one of the standard bearers in the Southern California home haunt scene, and we’ll definitely be making a return trip next season. 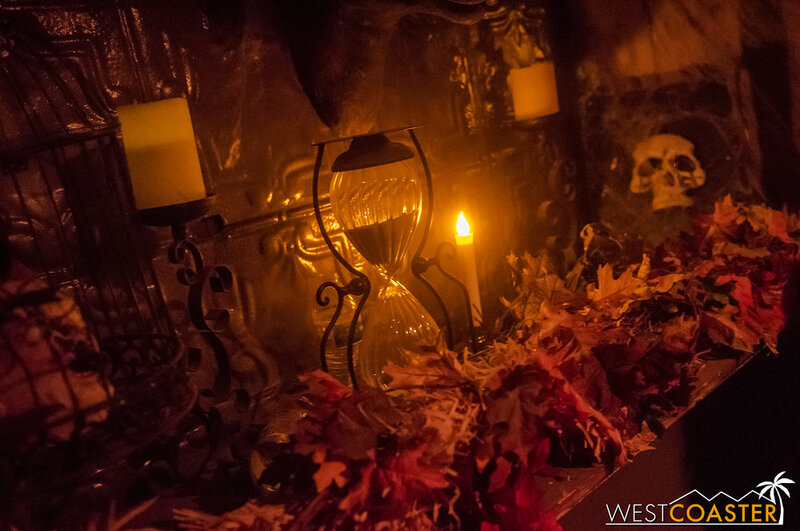 This long-running, epic home haunt is sure to be thrilling guests for another fall!